Trembling on the brink of April, it’s finally getting to look and feel like spring up here on the hillside. 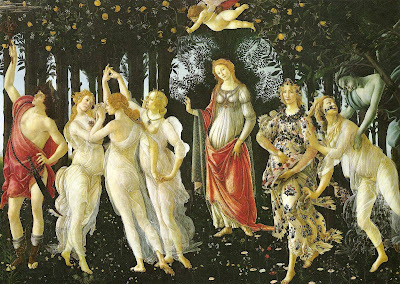 I’m going to keep my eyes open to see if I can catch a glimpse of Botticelli’s Primavera dancing through the woods with her various companions heralding the coming of the growing and flowering season. I’ve had an interesting introduction to micro-environments; although we’re only about 500 feet further up the hill from Fritz’s Center, we’re a good two weeks or more later in the sprouting of bulbs and other early spring plants. Up here, we’ve finally got crocus in blossom, day lily and chrysanthemum foliage developing. The big colony of crows we got to know last summer is back again in the patch of woods between the house and the Center. I like crows for the same reason, I think, that I love cats. They’re smart, curious and they act like they own the place which, of course, they do--as long as nobody cuts everything down and puts up another s__tbox condo development. I was running garden hose up the hillside to the site of the future garden terraces last Saturday when Fritz popped his head out of the second floor rear door and alerted me to the fact that at long last the town appraiser had arrived. Our certificate of occupancy was issued early last June. I thought they’d get an appraiser out here buckety-buck so as to get property taxes higher than just land value out of me as soon as possible. But it took this long and I saved some money on the last two bills. Norm was a nice guy, complimented the look of the house and, interestingly, asked if we’d come up with a name for it yet. This surprised me since Americans don’t generally name houses unless they’re up in the grand estate category. The fact is that we’ve talked a lot about a name but haven’t settled on anything yet, except that it’s going to be something about light. The house is filled with light and in fact, architecturally it’s ABOUT light. Maybe we’ll call it Lucifer (“light bearer”)—although that might bring the Jehovah’s Witnesses or the Mormons up our driveway to try to “save” us from Satan worship. Anyway, Fritz was careful to point out to Norm that there weren’t hardwood floors anywhere in the house (we’d been warned that appraisers frequently assume you have them and drive the tax way up) just the cement slab downstairs and underflooring topped with linoleum upstairs. We also gave him a set of the construction drawings and a scale ruler so he could do his measurements quickly and easily instead of having to crawl around all around the house outside. I can go to the town’s municipal offices in a couple of weeks and get the word on the appraised value and find out just how much the taxes will be. Raymond tends to be higher than surrounding towns in taxing property, unfortunately. This was sent to Fritz by a friend and we both loved it. 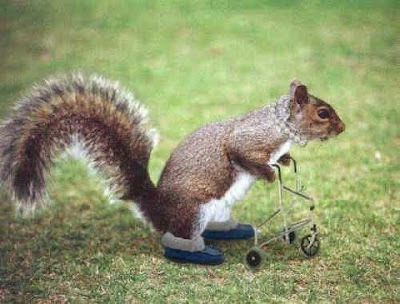 The original caption is: Retired Florida Squirrel, although it could also be Squirrel Auditioning for Mel Brooks’ The Producers. And this was sent by another friend and is posted for everyone’s amazement but particularly for Doug Taron (although he’ll probably find it to be “business as usual”). Your place with Fritz sounds lovely. I guess I can dig into your archives more... but, what is Fritz's Center? hugs from Portland Oregon, a great plave to garden. An Atlas Moth is never business as usual. synchronicity - I have the Graces on my laptop as my wall paper. I love the crows too, they always make me smile. Nothing coming up out of the ground here yet. 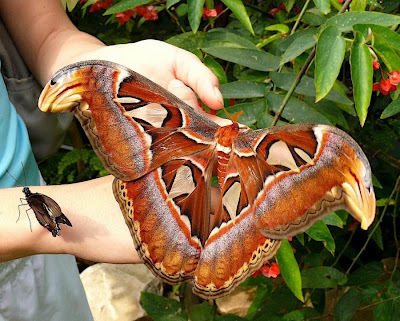 Yes, those Atlas Moths are nice. I have taken many photographs of them close to my house and also of the caterpillars before they became moths. Sadly I cant attach those pics here.